In a span of 75 years, between 1926 and 2001, six books appeared which greatly influenced Western Man’s thinking about his own civilization, so called Western Civilization. 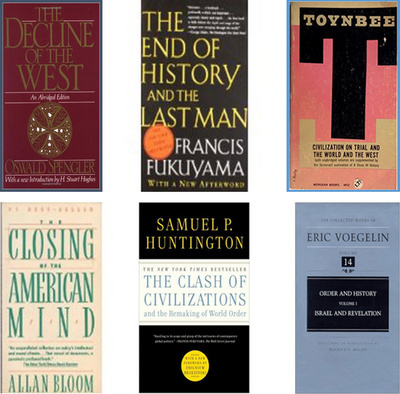 In chronological order of appearance they are: Oswald Spangler’s The Decline of the West (1926); Arnold Toynbee’s Civilization on Trial (1958); Allan Bloom’s The Closing of the American Mind (1987); Francis Fukuyama’s The End of History (1992); Samuel Huntington’s The Clash of Civilizations and the Remaking of World Order (1998); and Erik Voegelin’s Order and History (2001). In this essay we’ll survey those six books to determine how they have influenced the thinking of conservative ideologies which believe that while it is true that the West is in decline, there is still time to mitigate it or even to reverse it and preserve it for posterity. A mere glance at the titles of those books will hint at what the fuss and concern of those conservatives are. They go a long way in explaining their alarm at what they deem is an invasion of Europe by Moslems from Syria or Afghanistan or Turkey. 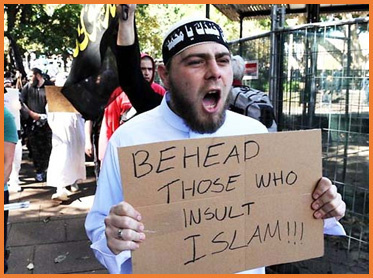 They feel that Western Christian Civilization has to be defended anew from the hordes of Moslem invaders threatening its very existence. This is going on as we speak in Hungary which has now closed its borders justifying the measure as the defense of Europe. The lazy way to explain this sad phenomenon of the advocacy of fortress Europe is to brand all those who invoke the preservation of heritage and civilization as sheer xenophobes or fascists, even racists, which they probably are; but such a shallow explanation does not even begin to touch the complexities of the Western cultural identity. In fact, it can be safely asserted that many of the crisis of present day EU are due to the refusal to search for and discover its genuine historical identity rather than summarily dismiss such a search as anti-modern, obscurantist, retrograde and medieval. I believe that part of the problem is the failed distinction between what is universal and what is particular in Western Civilization. Characteristically, the imagined goods of modern progressive or leftist ideologies are conceived to be “universal” values (such as liberty, equality, and fraternity), whereas the goods and values defended by conservatives are more readily understood as contingent particulars. There does not appear to be a single substance knowable as Tradition per se, but rather many historical traditions, great and small, each making a claim for allegiance and conservation on its own particular terms. As a result, while there may be a Socialist International or a Communist International—one may even speak of a Liberal International—there has never been a Conservative International. There is, however, one “quasi-universal” that conservatives of many nations have understood themselves to be conserving: the West. Obviously, the very word indicates that this good or value is not truly universal: it excludes, at least, the East. On the other hand, insofar as the term denotes a civilization transcending in space any particular Western state, transcending in time the history of any particular Western nation, and transcending in intellectual scope or catholicity any particular Western philosophy or doctrine, “the West” stretches toward a kind of universality. To speak of the West is to speak of something cosmopolitan, and yet not deracinated. Perhaps the defense of the West is close to the heart of what it means to be a conservative in the modern world—yet the definition of the West and the identification of the threats to it is also a source of disagreement among conservatives of various sorts, not to speak of progressives and liberals. Earlier and particularly nineteenth-century assumptions about the West were nearly always whiggish celebrations of the historically “inevitable” progress of Western European civilization to its rightful place in the imperial sun: “Wider still and wider shall thy bounds be set,/ God, who made thee mighty, make thee mightier yet” was a British invocation, but it summed up a more general sense that the West was simply “the best”—and destined for indefinite global dominion. That confidence, however, was profoundly shaken by the civilizational self-immolation of the First World War. For many on the Left, the carnage of the Great War was evidence of the structural flaws of Western “bourgeois democracy,” requiring the remedy of revolution. Against whom or what is it, then, that the West finds itself in need of defense? Two general forms of threat may be identified. First, over the course of the twentieth century it was frequently contended that the West must be defended from internal decay or decline. Conservative reflection on this theme was prompted in the first instance by an engagement with the thought of Oswald Spengler, whose book The Decline of the West was a publishing sensation in Germany and Europe immediately after the First World War. In a resonant, even poetic, though not altogether scientific manner, this prophet of pessimism argued that civilizations are organic wholes organized around a High Culture with a particular “Soul.” Civilizations throughout history have risen and fallen in a pattern of birth, growth, apex, decline, and death—and our Western civilization is no different. It is doomed like all the others. In Spengler’s view, the West was clearly in the last phase of its civilizational life: the “Soul” was no longer animating the body. The telltale signs of a High Culture’s decay included skepticism, materialism, scientism, and the fall of philosophy into mere academicism on the one hand, and urbanization, vulgar democracy, the rule of the rich, and eventually bureaucracy on the other hand. The cataclysm of the two world wars in the first half of the twentieth century seemed to many to lend plausibility to the contention that the civilization of Western Europe (and its diaspora in the New World) was now entering its “twilight.” Vladimir Putin still goes around preaching this doctrine. While Spengler himself held that the roughly thousand-year civilizational life-cycle was a fact of nature beyond man’s ability to control or modify—in short, that our civilization’s decline was inevitable and irreversible—this was not the lesson conservatives took from his work. Conservatism, after all, was accustomed to resisting the “tides” of history; indeed, conservatism often specialized in imagining ways to “turn back the clock.“ Far from leading to an acquiescence in pessimism, therefore, Spenglerian gloom served as a rallying cry, a call both to action and to reflection: if the sources of decay and decline could be uncovered, perhaps they could also be reversed. This has been the rallying crying of most 20th century dictators on both the right and the left. Another writer whose thoughts on the rise and fall of civilizations colored conservative understandings of the West’s predicament was the philosophical historian Arnold Toynbee. Writing primarily in the 1950s, Toynbee developed a universal history of civilizations in terms of challenge and response. The challenge might be physical (e.g., the cultivation of nearly inarable land), civil-social (an internal intellectual crisis or religio-political faction), or external (the pressure of another civilization). Whatever the case, the response of a healthy and growing civilization depended upon the efforts of creative minorities able to meet the challenge. (In the absence of any challenges whatsoever, civilizations tended simply to decay.) The signs of civilizational decline, in turn, were a ruling minority turned in on itself and on its past glories—no longer creative—and the construction of a “Universal State” that acted to smother dissent and discontentment among an emergent “Proletariat.” Here one thinks of Nazism, or Fascism or Communism. While Toynbee’s work was by no means accepted uncritically, conservatives did find many points of agreement. Toynbee, for example, tended to highlight religion as a source of recurring civilizational renewal, and conservatives too saw in religion a source of hope for the West. Toynbee’s “Universal State” and “Proletariat,” moreover, had something in common with the centralizing “collectivism” and emerging “mass society” of the twentieth century, against both of which conservatives had set themselves: perhaps, through conservative efforts, the West could retain or regain its individualistic spirit and so continue to nurture creative minorities. Most significantly, Toynbee was no determinist. There was no set date for the West’s demise; all depended on particular human choices and human actions. And, Toynbee admonished, “Civilizations die from suicide, not by murder.” It was up to conservatives to forestall, through acts of cultural recovery, the West’s suicidal tendencies. Beyond the threat of internal decline, “the West” has also been understood to require defense against threats arising externally, in international conflict. By invoking loyalty to the West as a whole, one may make “one’s own” the political concerns of other peoples who are not fellow citizens of one’s nation-state. In other words, the West is a basis or rationale for “natural” alliance in time of war. Thus, the British during the First World War were eager for that conflict to be seen by their potential allies as one pitting the liberal and civilized traditions of the West against invading hordes from the East, “the Hun.” In this way, isolationist America and unenthusiastic Commonwealth countries could be brought into the conflict as allies in the common defense of (Western) civilization itself—rather than in defense of British imperial interests. The inclusion of the Soviet Union among the Allies of the Second World War tended to obstruct recourse to the language of the West, but even still, both Churchill and De Gaulle in their wartime speeches spoke of the defense of “liberal and Christian civilization,” a good short description of the meaning of the West in contrast with Nazi barbarism. With the Nazi defeat and the advent of the Cold War with the Soviet Union, the defense of the West could serve as the basis for the NATO alliance against the totalitarian barbarism of the Eastern Bloc. It was in the context of the Cold War that the West became an especially important concept for a nascent Western conservatism. Given that context, the term West carried in the first instance both geostrategic and economic connotations—mirroring the fact that our Soviet Communist adversaries understood economics to be at the “base” of all political, cultural, and spiritual life. Thus, despite its cultural dissimilarities, Japan could be understood to stand among the “Western” nations, since it was a free-market democracy and a U.S. ally (having been reconstructed as such by the Americans after World War II), while Spain under Franco might be understood to stand outside the West, since it was not (yet) a NATO member, nor a democracy. During the Cold War, the world was more or less neatly divided between the Communist Eastern Bloc, the so-called Western alliance (NATO) whose glue was democracy, and those nations which held themselves to be Non-Aligned. Christianity, after all, had absorbed ancient philosophy; the church had displaced the Roman Empire as a universal jurisdiction; and the Goths were converted. In such an account, Christianity is the primary “marker” of the West, and so Rome, the eternal city, might be understood as the main taproot among the other, lesser roots. Such an account had, and continues to have, a particular appeal for traditionalist conservatives: the West they seek to defend is readily recognizable as Christendom. As a result, such conservatism has tended to have a high opinion of medieval civilization, finding within it a privileged cultural synthesis that remains normative, and so standing in a critical relationship to certain features of the contemporary world. Such a conservatism also searches in the Middle Ages for the origins of many Western institutions and practices that are often mistaken for modern innovations. The source of the West’s dynamism, for example, is found to be the Church. Christopher Dawson’s The Making of Europe, jumps to mind here. In America, moreover, a Jerusalem-Athens-Rome account of the West was usually thought unsatisfactory, since it tended to confer primacy to Roman Catholicism as the synthesis of Athens and Jerusalem—something most non-Catholics were not prepared to concede. Protestants and others understood “liberty of conscience” and the protection of the “private judgment” of the individual to be singularly “Western” achievements, responsible for the West’s special dynamism during the modern period—and these were believed to follow only from the Reformation’s repudiation of Roman “obscurantism,” and even Roman “despotism.” As has been said: anti-Catholicism became the last acceptable bias. For all of that, Strauss’s own choice was for Athens, not Jerusalem: Athens is the taproot in his account of the West, reaching deeper than other, lesser roots. For most neoconservative followers of Strauss, therefore, free inquiry and Socratic enlightenment are the primary “markers” of the West. The West they seek to defend is not Christendom, but rather the civilization that philosophy built and in which universal reason has its home: in other words, the civilization of modern liberal democracy. Related to this Straussian account of the primacy of Western philosophy are those libertarian or classical liberal conservatives for whom the free market economy, with its abundant prosperity and constant technological innovation, constitutes the characteristic Western excellence. With some exceptions, such conservatives tend to identify the West with the “modern civilization” that arose in the eighteenth century as the project of the Anglo-Scottish Enlightenment—and often, it is said, in self-conscious rejection of earlier traditions. Whereas Straussians give priority to the modern political order, libertarians and classical liberals give priority to the modern economic order. As globalization—the universalization of Western business practices and popular culture—gathered strength in the 1990s, the “facts on the ground” lent further credence to an understanding of the West as a universal civilization openly available to all. Hence America, as the “the first universal nation“ seemed to stand as the West’s (and the world’s) vanguard and model. The terrorist attacks of September 11, 2001, brought a jolting return to History. Suddenly, we were confronted anew by the most traditional enemy from the East: Islam—or at least elements from within Islam that were intent to resist the rise of a universal civilization built on Western foundations. Shortly after Fukuyama had published his work on the “end of history” (1992) Samuel Huntington had published an article (1993) and later a book, The Clash of Civilizations (1996) arguing that, after the Cold War, international conflict would no longer be nationalist (as had been the case in the nineteenth century), nor ideological (as had been the case in the twentieth), but would instead center around a “clash of civilizations.” That is, cultural identities and antagonisms would play a major role in relations among states. Presciently, he observed that Islam in particular has “bloody borders”—a greatly disproportionate number of the ongoing conflicts in the world involve Muslims. September 11 appeared to prove Huntington’s analysis more cogent than Fukuyama’s: there would be no escape from the burden of history, and ideas and institutions could not be discussed apart from culture and the historical process. On the other hand, the confrontation with jihad (to say nothing of the spectacular recent rise of China) is beginning to force a reacquaintance with the particularities or non-universal elements of the West. Not least, we begin to appreciate more fully that Western ideals and institutions depend at least to some extent on cultural foundations that are the possession of historically Western peoples—and so we view with alarm the demographics of contemporary Europe, the cradle of the West, with a burgeoning Muslim minority amidst a dwindling native population. Hence the closing of the borders. Even if the West is less universal than we have lately thought, so the argument goes, it is still good, still ours, and still in need of a defense. This explains the forbidding of the constructions of mosques and the closing of the frontiers (Hungary in particular which claims to be defending nothing less than European Christendom) to the hordes of Moslem refugees fleeing from the Syrian conflict and seeking refuge and a new life in the EU. And yet there are some European intellectuals that have been exploring the idea of multiple modernities which would include religion as part of the ongoing dialogue in the public agora on the West’s identity. Jurgen Habermas is one of those. But for the moment let’s leave the concept of “multiple modernities” for another essay in the Ovi Symposium.